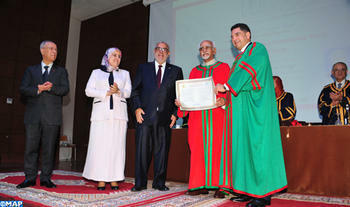 The Mohammed V University of Rabat awarded, on June 1st 2016, the “Doctorate Honoris Causa” to Indian Vice-President Mr. Mohammad Hamid Ansari who is on an official visit to Morocco. His Majesty King Mohammed VI offered, May 31st 2016 in Rabat, a dinner in honor of Indian Vice President, Mr. Mohammad Hamid Ansari, chaired by Head of Government, Mr. Abdelilah Benkirane. The Moroccan Academy of Diplomatic Studies (AMED) and the Indian Foreign Service Institute inked, in Rabat on May 31st 2016, a Memorandum of Understanding (MoU) and a cultural exchange program (2016-2019). 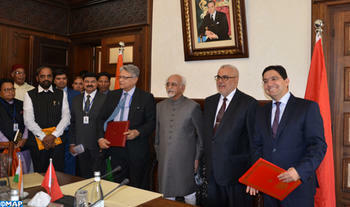 The Head of Government, Mr. Abdelilah Benkirane and India’s vice-president, Mr. Mohammad Hamid Ansari, stressed, in Rabat on May 31st 2016, the need for further efforts to give practical content to partnership between the two countries. India was very glad to welcome His Majesty King Mohammed VI on the occasion of the 3rd “India-Africa Forum” last October, said, on May 31st 2016 in Rabat, Indian Vice-president, Mr. Mohammad Hamid Ansari, noting that the sovereign’s participation is a great value added to this event.